Where is truth? Vice President Pence disrespects the intelligence of the American people. 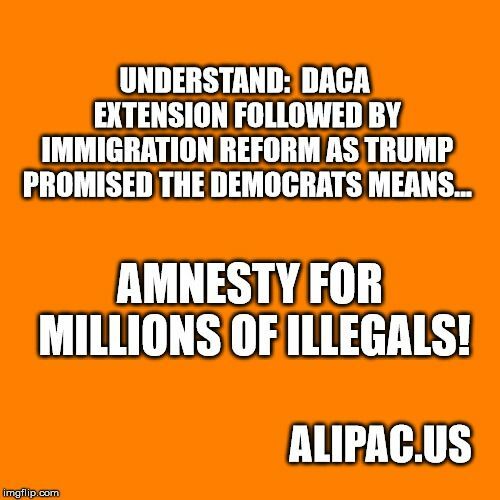 Allowing illegal aliens and TPS foreign citizens to keep getting an extension of time to stay and steal from taxpayers is amnesty. Some of these people have been here for a decade or more. Temporary has long passed and being here illegally should be dealt with immediately. The illegal aliens and TPS holders use their American born children as anchors, too. Birthright citizenship needs to end. We cannot get a wall or real interior enforcement but giving out amnesty is so easy and immediate. We keep getting conned. Beezer, Judy, stoptheinvaders and 1 others like this. Every additional day they stay on our soil IS amnesty and a con on the American people. LET DACA WORK PERMITS EXPIRE AND THEY CAN SELL OUT, PACK UP AND GO HOME ALONG WITH THEIR MINOR CHILDREN! These ungrateful people abuse our benefit systems, mouth off in our streets, kick and scream for their rights. They have no right to be here. That privilege was extended as a temporary measure to help them. We want these programs terminated! We are sick of the fraud and abuse in these programs. Terminate and defund them all. We are not responsible to pay for the entire worlds citizens or pay for their problems. No where in our constitution does it say to TAKE money from American workers to pay for foreigners! Shut it down and send them home. We already give their countries billions out of our personal wallets against our will and they still dump their unwanted overbreeding poor on our backs. Enough is enough. Stop kicking this can down the road and start setting a daily quota to deport them. They are their countries responsibility. We have our own backyard to clean up...not dump more problems on our backs to pay for. No UAC's at our border and no processing them for asylum in their country. We have an obligation to take care of our own children and they must take care of their own. They are overwhelming our schools and healthcare system...it will collapse. I hope Pence does not run again, I would not want him in charge of our country. He is too religious, it clouds his judgement and will use his "heart and bible" to make policy and not what is good for our peace, safety and security of our citizens. He seems like a good man, but not to run this country. Last edited by Beezer; 01-20-2019 at 12:41 PM. Vice President Mike Pence is a liar and shame on Breitbart for not including any counter views in this piece. Their headlines yesterday (Day of Amnesty Trump's Speech) read AMNESTY!!! The DACA ones are at prime baby bearing age. They should go. MW, GeorgiaPeach and Beezer like this. 90 day notice to vacate our country. Sell out, pack up and go home with your illegal DACA parents who are still here. Obama had NO right to do this which makes them illegal!